ABC stands for A Better Chance and is one of the oldest national organizations of its kind, helping young people of color achieve their potential through education. 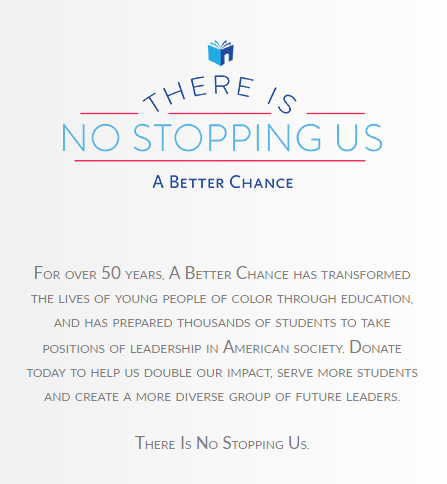 National A Better Chance Inc.’s program started in 1963, and the first scholars came to Madison A Better Chance in 1970. Madison ABC is one of National A Better Chance’s most successful and longstanding community school programs. For over 50 years, A Better Chance has transformed the lives of young people of color through education, and has prepared thousands of students to take positions of leadership in American society. The mission of Madison A Better Chance is to provide academically-talented young people of color the opportunity to have an outstanding secondary school education in preparation for college. Their four year experience at a high school such as Daniel Hand gives them the skills they need to excel in college and assume positions of leadership and responsibility. Madison A Better Chance has an all volunteer Board of Directors that sets policies for the program and works to assure its success. The Madison ABC program is one of the most successful and long standing public school ABC programs, having started in 1970. Madison ABC is overseen by a volunteer board of directors, and our mission is to provide the opportunity for an outstanding secondary school education – right here at Daniel Hand High School (DHHS) – to qualified students from inner city communities. The students’ four-year experience at DHHS offers them what they need to excel in college and go on to assume positions of leadership and responsibility.